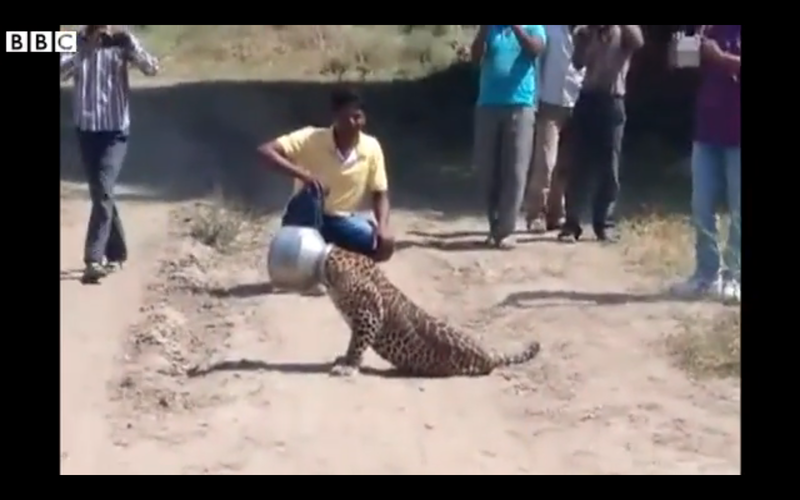 This Leopard With Its Head Stuck In A Pot Is Exactly How I Feel Today. An unlucky leopard got its head stuck in a metal pot after wandering into a North Indian village on Wednesday. Local media reported that the leopard was thirsty and had become stuck after trying to drink water from the pot. It took forest officials more than six hours to tranquilise and free the leopard from the pot. The animal was later released back into the wild. This is everyone today, and if its not, you probably think you’re better than the rest of us so you guys can go to hell. Here we are just floundering our way through the day with our head completely stuck in a metal pot named Monday. All we’re trying to do is get little sips of water so we don’t completely die and next thing you know you look like the village idiot. Not to mention we also don’t want to get murdered in India. That’s not a metaphor, that’s just facts. Luckily for this guy, he gets to be tranquilized while we’re just toiling away struggling for air. This entry was posted in Uncategorized and tagged India, Leopard, Mondays on October 5, 2015 by edlee.